It was back in 1990 that Edinburgh’s annual festival of children’s theatre first appeared in Inverleith Park, in a series of tents and marquees that stood up bravely to some blustery spring weather; which means that when the festival opens for business on 25 May this year, with a Family Day of fun at the National Museum of Scotland, it will be celebrating its 30th edition, and the fact that many of the children it entertained in its first tentative years are now parents themselves. 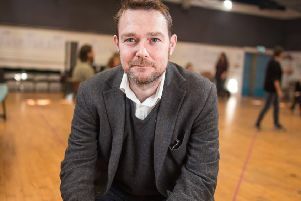 Back then, the aim of its founders – including its first director, Duncan Low – was simply to show some of the riches of international children’s theatre to young audiences in Scotland, and to Scottish theatre artists. All across Europe, in particular, there were countries and companies that had invested in children’s theatre to an extent then rare in the UK; and audiences in Scotland saw, and marvelled, and began to raise their expectations of what theatre for children could achieve. The result, 29 years on, is not only an event that has become one of the world’s major celebrations of children’s theatre, attracting artists and delegates from across the globe; but a Scottish children’s theatre scene utterly transformed, so that each year now around of the third of the work shown in the festival is created by Scottish companies that have become major players in the world of international children’s theatre. The festival’s current director Noel Jordan was delighted to announce last week that the 2019 programme is no exception. Of the 15 shows on view this year, from eight countries – Denmark, France, Germany, the Netherlands, Scotland, England, Australia and Belgium – four will be made in Scotland, three of them commissioned or co-commissioned by the Edinburgh International Children’s Festival itself. The Festival’s 2019 programme also includes Playful Tiger, a new adaptation of Barrowland Ballet’s Tiger Tales, redesigned by choreographer Natasha Gilmore for children with autism, and Super Human Heroes, a brand new show from Glasgow company The Letter J – commissioned by the children’s festival with the Scottish Government’s Expo Fund – about superhero culture and children’s mental health, which is already on a brief preview tour around Scotland. And Scotland’s women-led company Stellar Quines makes its children’s festival debut this year with a new version of Australian playwright Finegan Kruckemeyer’s acclaimed play This Girl Laughs, This Girl Cries, This Girl Does Nothing, a modern legend about how three very different young sisters respond when their father abandons them in a forest. All of this Scottish work, of course, is interwoven with an international programme that includes beautiful physical theatre for very young children from Denmark, Germany and France, a new version of Emil And The Detectives from the Australian company Slingsby, and a return visit from Bronks of Belgium with their wonderful physical theatre show Us/Them – inspired by the horrifying school siege in Beslan in 2004 – which won a Scotsman Fringe First award in Edinburgh in 2016. There will also be a three-week residency at a warehouse in Leith by legendary London-based site-specific company Punch Drunk, supported by a complex network of funding from the Scottish Government’s Place programme. The Edinburgh International Children’s Festival 2019 runs from 25 May until 2 June, at venues across Edinburgh. Super Human Heroes is at the Byre Theatre, St Andrews, tomorrow; This Girl Laughs, This Girl Cries, This Girl Does Nothing will be on a pre-festival Scottish tour from 11-25 May.